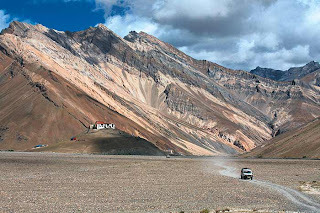 The Zanskar valley lies in remotest Ladakh. 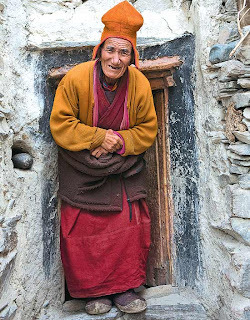 This is a region so remote that it takes three days of driving from Leh just to get there—a drive through a convoluted land of tortured rock and deep gorges. The journey takes you through western Ladakh, at first along the Indus and then the Suru and Stod rivers, before reaching Padum, the capital of the district. 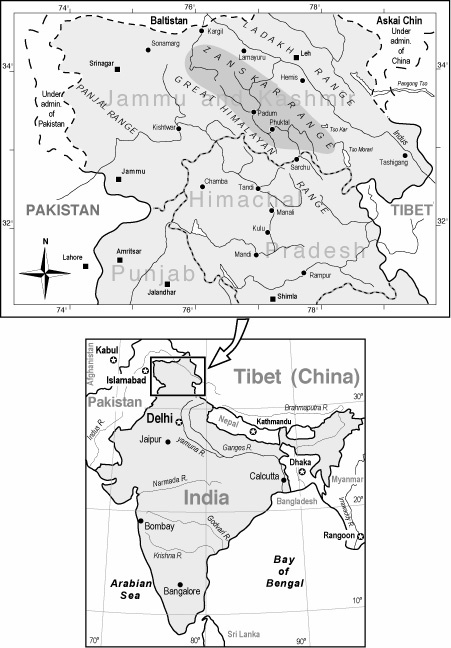 This is the ‘land of white copper’ (Zang is the word for copper here), and the feisty torrent of the same name originates here on the northern flanks of the Great Himalayan Range. The river then carves a dramatic route north through the Zanskar range before flowing into the Indus. 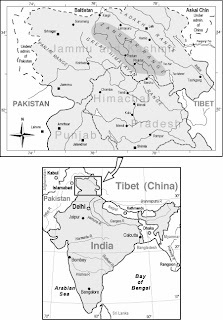 In the winter months, the roads are snowed in and the frozen surface of the Zanskar river is the only ‘road’ leading in and out of the region. 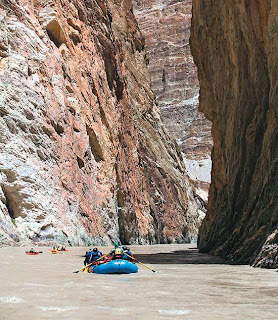 In summer, the ice-melt facilitates a very different kind of passage through the canyon system—on inflatable rafts and kayaks. It’s an adrenaline-pumping six-day white water run through surreal, constantly shifting landscape. The high point is the gorge itself—near-vertical rock faces hem in the violent torrent rushing thousands of feet below. An ambitious road project might soon encroach upon this region. Before the road renders it less remote and more pedestrian, committed adventure enthusiasts might want to journey into the heart of a river that’s never less than spectacular. 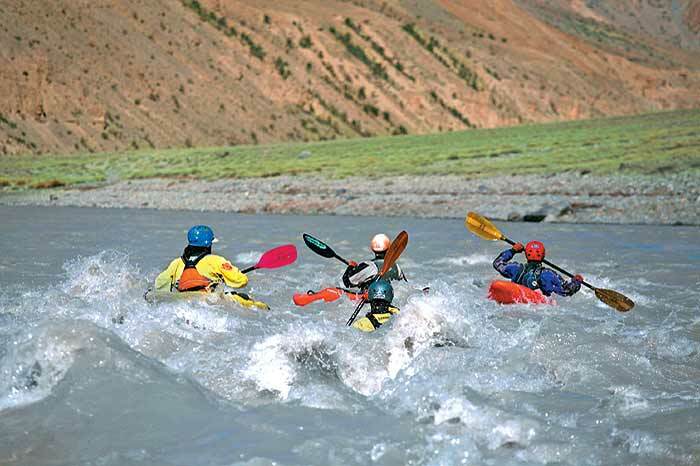 While the rafting remains the highlight of this trip, the three-day drive leading into Zanskar throws up its own set of natural wonders. The lush green bowl of the Suru valley with its distinctively Islamic culture transforms into a windswept desert near the Gelukpa Buddhist monastery of Rangdum (above). 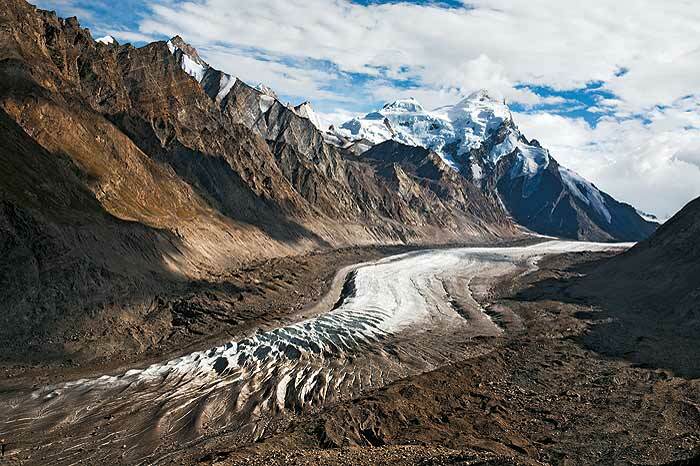 Massive glaciers overhang the road. 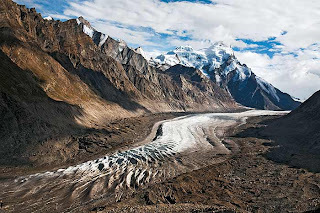 The vast Durung Drung glacier (below) is the largest in Ladakh after Siachen and it gives rise to the Stod river, one of the main tributaries of the Zanskar. The first two days are easy floating on the Stod, offering stunning views and walks to the surrounding gompas and villages. Most of the rapids here are Grade II with some approaching Grade III. The Stod joins up with the Tsarap Chu to form the Zanskar. 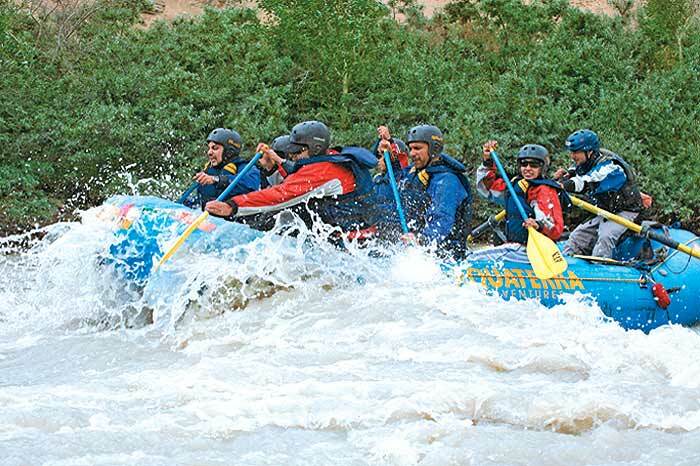 The waters get trickier further downstream, lashing the front paddlers with rapid frequency. 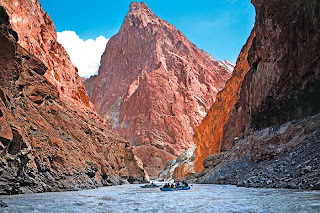 The river unerringly throws up a gem or two from its vast array of rock formations on each day of the river run: the giant pyramid of red rock is one such. 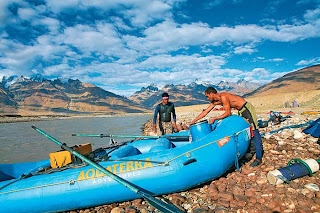 While nothing can quite beat kayaking on a river, it takes considerable training to garner the finesse required to manoeuvre a kayak. 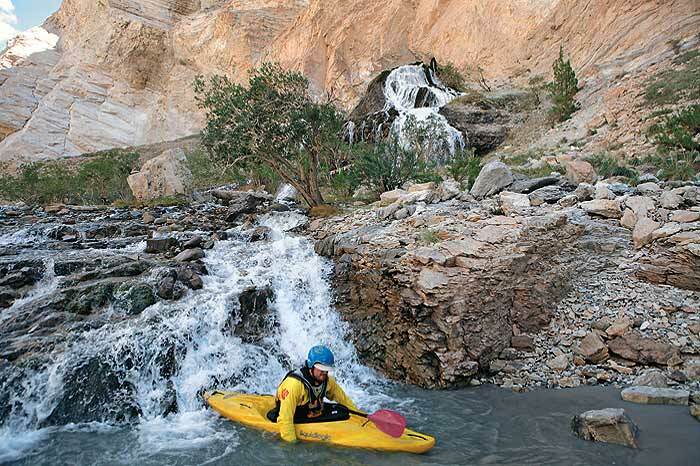 Safety kayakers lead the river run each day, keeping a sharp look out for MOB (man overboard). Day three onwards, the river hurtles into a dramatic copper-coloured gorge, snaking through narrow walls of striated granite with 2,000-foot-high cliffs looming above. The pristine silence of this traverse is broken only by the violent rapids that now get bigger, louder and trickier. The biggest hurdle in this section is the ‘Constriction’, where the river is squeezed into a narrow gap about eighteen feet wide. The river responds with furious eddy lines and boils, which constantly threaten to flip a raft in the blink of an eye.